I recently spent a full day piloting a 2018 Harley-Davidson Street Glide. The Glide is The Motor Company’s sleek heavyweight cruiser. It features the Milwaukee Eight 107 engine, navigation, cruise control and all the other high end goodies…except ABS. 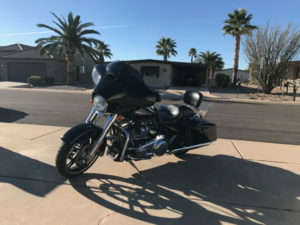 I rented the 2018 Harley Street Glide big twin while visiting an aunt in Phoenix through EagleRider at Desert Wind Harley in Mesa, AZ and rode about 250 miles from Mesa to Tortilla Flats and on to Roosevelt Dam and back. My background as an instructor and journalist allows me to ride all kinds of motorcycles…including Harleys. That said, I don’t have as much saddle time on a lot of heavyweight cruisers as other types of bikes. I’m more of a performance bike guy, so I tend to base my priorities on how a machine works for its intended purpose and put less weight on image and practically zero on lifestyle. What this means is that this review is a general review of whether this machine does the job it is intended to do and where there may be room for improvement. Readers who are all about Harley may want to make constructive comments to fill in some gaps in my findings. So, with that in mind, let’s get on with reviewing the Street Glide. FYI, my wife, Caroline, rode as passenger to give us a good idea of how a pillion does on the back. Harley claims that the Milwaukee-Eight 107ci (1,750cc) engine is smooth-running with crisp throttle response. I agree that the 107 is smooth-ish, especially when compared with older versions of the V-Twin. But, compared with the other V-twins on the market, I wouldn’t exactly call it smooth. Performance-wise, 111 foot-pounds of torque is very entertaining and provides plenty of get up and go to climb some steep hills at speed without a thought, even with a passenger. The stoppers stopped fine and were pretty easy to control. The front brake can be a bit snappy at slower speeds, so tapering off the lever and finishing with the rear brake is a good technique for smooth stops. The rear brake pedal is large, like all big cruisers, and provides good feel. But, the position was too forward and high for my tastes. This position makes it tough to drag the rear brake during slow speed u-turns. This bike (despite the sales guy’s statement) did not have ABS; a disservice to H-D customers shelling out over $21k. I think it’s silly to have to fork over another $795 for the ABS option. Stiff clutch pull. It’s good practice to remain in first gear while sitting at a stoplight, but the heavy clutch pull makes this noticeably unpleasant. If I had ridden this bike for a week, I’m sure my left arm would look like Popeye’s. Clutch engagement could have been more linear as well. I had to be deliberate about easing the clutch slowly when getting underway. I got used to it quickly enough, but it takes some attention. Why do big V-twin transmissions always clunk? The Indian Chieftain I rode a couple years back also clunked. I’m pretty sure H-D can smooth the shifting, but I bet they’d get complaints. Heck, it even seems that Honda designs some clunking into their new clutchless DCT Goldwing. That visceral clunk gives the rider a familiar feeling of traditional gear changes, but I’d better appreciate a smoother cog-set. Maybe I’m just being a conspiracy theorist and there really is no practical way to make these transmissions as buttery smooth as my old Triumph Street Triple, or Honda VFR or the BMW R1200RS I rode in the Alps. But, I bet there is. This particular bike had its heel-toe shifter adjusted so there is very little room to get my toe between the floorboard and the fat shifter rubber. This is adjustable (I assume). I just don’t get the heel shifter. I know the reasons for it, like saving the top of your left boot from scuffing, or to have solid shifts. But, I never use it and it just gets in the way of positioning my foot on the back edge of the board. Personally, I’d remove it. With the amount of Infotainment this bike has, the number of buttons on the handlebars isn’t terrible. The logic of the switches is fine, with the “home” and “select” button easy to use. The horn button is too high on the left cluster for emergency use, though. Harley-splain this to me: Why in the world does Harley insist on the two switch turn signal system rather than one switch like the rest of the world? They work fine, but still. Being used to performance bikes, an 800+ pound bike is not very fun to me. Sure, the heft disappears once underway, but the weight makes me feel like a rookie when it comes to slow maneuvering (especially with a passenger). I used all of my tricks to keep things under control at slow speeds and it got better after some time, but it’s just not fun. One reason the bike feels so cumbersome at slow speeds is the front geometry/tire size. Lean the bike slightly to the left and the front wheel wants to abruptly drop into the turn. Making tight turns at slow speeds requires the front wheel to turn, but too much steering angle occurring too quickly causes imbalance. It takes concerted effort to hold the front wheel from over-steering and dropping the bike on its side. We rode up to Tortilla Flat on the twisty Apache Trail east of Phoenix. The road has several 15 mph turns that can be taken at 20-25 mph. At this “mid” speed, the same slow speed oversteer occurs where the front wheel wants to turn in. This countersteers the front wheel, causing the bike to stand up. I had to wrestle the handlebars to keep the bike tracking precisely. And even though increasing throttle slightly through corners is good technique, this only caused the bike to stand up more. Add 5-8 mph and the tendency eases. This bike had light, neutral feel when turning left. However, when turning right, this particular bike required a bit of constant pressure on the inside handlebar to keep it from standing up mid-corner. Not sure if this rental bike has an alignment issue, but this asymmetry was noticeable. The EFI works well. Once I calibrated my right hand to this throttle, all was smooth and predictable. Mid-corner maintenance throttle is great. ’nuff said. A chrome cover flips up to reveal the fuel cap. You then remove the cap and, um, put it somewhere so it won’t drop or where you’ll forget about it. Sorry, but it’s silly that I have to find a place to set down a gas cap while fueling. I’m pretty sure Harley can incorporate the chrome bling with a one piece sealed cap. The non-adjustable “sliver” of a windscreen mounted on top of the Batwing fairing was not for me. Wind blast landed directly on my helmet so that even with earplugs, I had ringing ears at the end of the day. And the buffeting became exhausting toward the end of our 250 mile ride. There is a toggle for opening a vent, but it didn’t help. I like looking over the screen so I wouldn’t put on a taller one on, so I guess I’d have to try it without any screen at all. The seating position reminds me of sitting in a car with feet forward and arms up. This position rounds my back and eventually wrecks my upper and lower spine. To make it work better for me, I rode with the balls of my feet on the back edge of the floorboards for a more neutral and balanced position. The wide seat was comfortable enough for the 200+ mile day, but I was starting to feel the burn at the very end. Regarding passenger comfort, the seat shape is fine, but the seating position slid Caroline forward and prevented her from sitting up. The backrest is essential for keeping your pillion happy. The Street Glide sure looks and sounds great. I can see why almost half of America’s motorcycle riders opt for the big twins. It’s beautiful, has the visceral sensation of machines from the past, but with most of the expected modern amenities. It throbs along at highway speeds without a care in the world and commands attention wherever you go. But, none of these qualities will diminish if H-D were to smooth out some of the rough edges. My short time on the Street Glide was enjoyable. I looked past the quirky handling and nit picking and had a good, but not great time. Much of the reason for my lukewarm reaction is simply becasue big, heavy motorcycles demand more physical and mental energy compared with a middleweight machine.